Transform your messy pantry into one of the most useful and organized spaces in your home. With these 6 easy steps to organize your kitchen pantry, we’ll help you put everything in order and keep it that way. How do you organize your kitchen pantry? The kitchen pantry is the perfect place to keep spices, snacks, and miscellaneous stuff out of the way. Because of this, the contents of your pantry are inherently out of sight – and, because of this, often entirely out of mind. This makes the pantry one of the easiest places in your home for clutter to accumulate. Fortunately, with a little effort, it isn’t hard to transform your pantry into one of the most useful and organized spaces in your home. Want to organize your kitchen pantry once and for all? Follow these steps! Step 1 – Clear it out. Don’t make the mistake of trying to organize your kitchen pantry by shuffling around the things inside. Instead, you’ll want to start with a clean slate. Clear your counters or a nearby table and spread out the contents of your pantry. Being able to view everything you need to store at once will allow you to truly assess what you’re trying to store and will enable you to approach your pantry organization project in a more methodical way. Step 2 – Clean it up. Don’t shove your stuff back into a dusty, dirty pantry. Instead, take the opportunity to deep-clean the space once everything has been removed. Wipe down your shelves and cut liners to fit to prevent future messes. Shake the crumbs out of any storage containers you already have, and sweep up any crumbs that have taken hold in the corners of the floor. This part doesn’t have to take very long. In fact, Real Simple has a checklist that shows how you can have a sparkling clean pantry in only 15 minutes. Step 3 – Consider storage solutions. Once you’ve cleaned out space and know what you’re working with, see if you need to invest in any storage solutions to help organize your kitchen pantry. If your pantry could benefit from a few bins or containers to keep things organized, don’t be afraid to invest in some items to keep you tidy. Baskets and bins can be used to store snacks, keep spices in order, and group similar ingredients. Pro-tip: Measure your shelves before you buy so you know what size containers will fit your space! This will save you so much time from going to the store and trying to guess. Then getting home and realizing it didn’t work. For more pro-tips, learn how to Organize Your Pantry Like a Professional in this article. If you have kids, consider dedicating a special bin for snacks just for them. When it’s time for a treat, they’ll love the opportunity to choose what to eat. Want some pantry inspiration? Here are some gorgeous pantries – and all of them have some very beautifully organized containers too. Beneath My Heart – Genius idea of putting loose food packets into labeled bins on the door. Southern Curls And Pearls – She keeps her bins from feeling crowded by utilizing white space. And she has some fantastic tips on differently sized organizers for her many uses. Classy Clutter – You can actually see in the before and after how much of a difference some labeled containers can make. Step 4 – Group like items together. To make it easier to find what you’re looking for, store items that belong together in the same area. This is where your bins can come in handy! Keep baking items like flour, cocoa powder, and baking soda next to each other, and store the chips with the other snacks – not with the canned goods. This tip is especially helpful if you have a home without much storage and have to keep non-food things in your pantry. Step 5 – Label everything. Once you’ve sorted your items and put them into their respective storage containers and corners of the pantry, it’s time to make some labels! Don’t give family members the excuse of not knowing where things belong. Print off some fun labels at home to make it easy for everyone to know what goes in which bin, or use a label maker to indicate where items should go on each shelf. Labeling bins can be a lot of fun. There are lots of small shops on Etsy that sell gorgeous labels that are one-of-a-kind. Or, you can find some chalkboard labels and handwrite them. No matter how you do it, labeling things is a very important step to organizing your pantry. It gives it the finishing touch and helps everyone know where things belong when they are putting away the groceries. Step 6 – Don’t get messy! 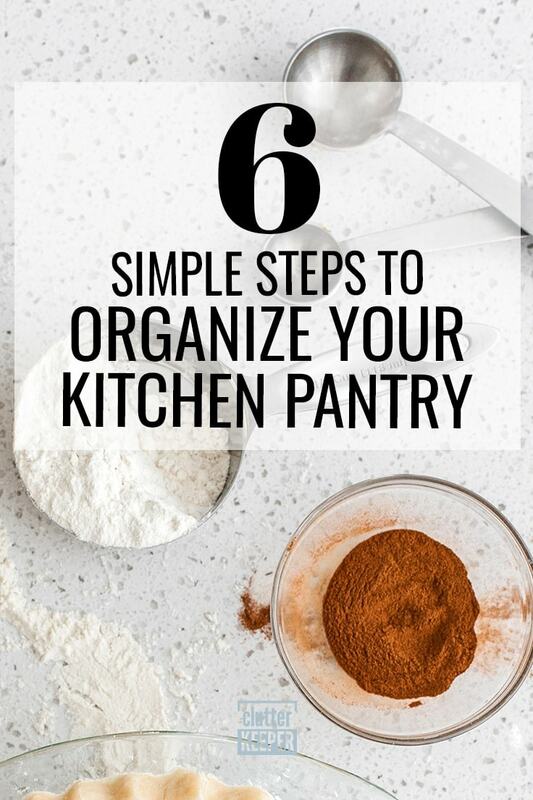 Once you’ve put time and effort into organizing your pantry, you shouldn’t let it get out of order again. Be diligent about putting things back where they belong and cleaning up messes as soon as they occur. Otherwise, you’ll soon find yourself right back where you started – staring at a cluttered pantry. The best way to prevent your pantry from returning to the mess it was before is to set a regular cleaning schedule. Once a month go through and do a 15-minute clean up. Wipe everything down, make sure all the items are where they belong, and donate the food or other stuff your family doesn’t need. What storage techniques helped you organize your kitchen pantry? Are there any organizational rules you follow here? If so, leave a comment below to share! We’ve got a great list of the most common pantry storage mistakes and solutions. Check to see if you are making any of these oversights and take your pantry to the next level! Now that you have a sparkling pantry, step back and enjoy it! Need some more organizing inspiration? There are a lot of amazing resources here on the Clutter Keeper blog. Here are a few more to help you create – and keep – the home of your dreams. How to Keep Your Kids Organized – If you struggle with kids that leave a trail of chaos wherever you go, you are not alone. And these tips will help you instill an organized lifestyle in your kids. 11 Cheap & Easy Laundry Room Hacks – Just like having an organized pantry is simple, creating an organized laundry room can be a breeze! 13 Family Command Center Ideas – Keeping track of everyone’s schedules and important papers is so much easier with these ideas. How to Create a Year-Round De-Cluttering Routine – Maintaining an organized lifestyle is an ongoing process that never ends. This routine makes it so much more manageable.